This is the second of a series of posts about shooting at the various locations that are part of the UTadventure Tours. Today’s tip is about shooting at the Great Salt Lake. I will be an instructor on the June 1st-6th tour this summer. Come join me. Saltair at the Great Salt Lake in Utah is a great location for both fine art nudes and glamour shots. For me shooting at Great Salt Lake is all about reflections. In the morning the water is still and flat and almost like a mirror. On the beach there are small ponds of water and fingers of sand that jut out into the lake, have the model stand on the opposite side of the water from you and shoot vertically or with a wide angle lens to include both them and their reflection in the water. Having them stand right at the water’s edge or actually in the water will enhance the effect. The Great Salt Lake is very shallow, and the model can be well off shore and the water will only come up to their ankles. Mix up the poses here, both soft sensual curves and sharp angular poses work well. If there are ripples in the water, the reflected light from the water’s surface can create interesting light patterns on the body. I like to position the model to maximize this effect. You are never sure what kind of background you are going to have at Saltair. Often times it is hazy in the distance which makes for a nice background where you can’t quite tell where the water meets the sky. On a clear day there are mountain peaks and islands in the distance and I like to place the model so they are between the peaks and are framed by the distance mountains. 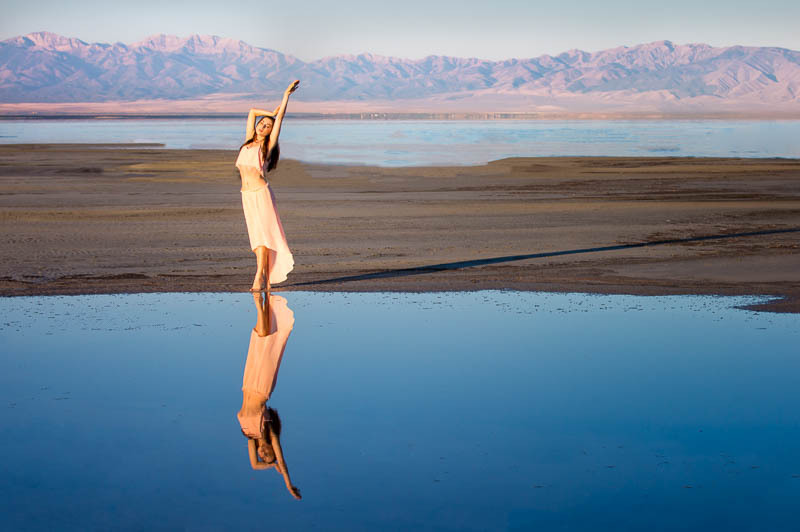 On the UTadventure Tours there are a lot of opportunities to have multiple models pose in your photo and Great Salt Lake is probably one of the best spots for this on the trip. I have an accomplished photographer friend who claims he has never seen a good photo with multiple models. That is of course not true, some of my best selling images have multiple models, however it does point out the fact that is can be challenging to make a good photo when there is more than one model. A lot of photographers will try to have all the models do the same pose, which is almost impossible to accomplish, any little variation in position between models is going to stand out and be easily visible to the the viewer and detracts from the image. The easiest way to fix this is to have the models pose in completely different poses, make it obvious that they are not trying to mimic each other. An important tip when posing multiple models is to have them interacting. This helps in creating a story and makes a more compelling image than just having multiple models independently in the frame. This interaction can be accomplished by either having them reaching out towards each other, or making physical contact with each other. Another approach is to stagger their distance from the camera. Having one model in the foreground and another further away in the background can add interest to the image. As you can see there are great shooting opportunities at the Great Salt Lake. Next stop on our Utah Tour? Looking Glass Arch.